"Those who read Marcia Morgan's book will be encouraged to identify and strive for new goals and will have the practical tools they need to attain them." Dana L. Sullivan ATTORNEY, NATIONAL BOARD OF DIRECTORS FOR GIRL'S INC.
How do you recover lost goals and dreams? How do you move forward if you are in transition or feeling lost or stuck? The answer can be as simple as focusing on everyday objects. 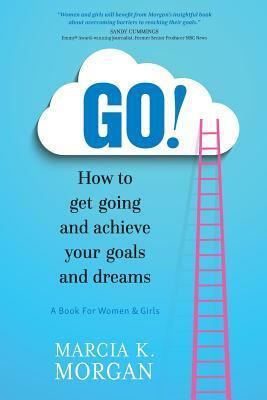 GO How to Get Going and Achieve your Goals and Dreams teaches women and girls in four guided steps, how to select and display special objects that represent their goals. Through mindfulness, repetitive visualization and tenacious planning, the Goal Objects (GO ) become an empowering compass to keep a woman on the path towards her goals. The Goal Objects become a metaphor of her life and regular reminder of what she wants to achieve.